Tired of the same old URL shorteners like TinyURL, tr.im or bit.ly? Ever wished you could run your very own URL shortener? In ColdFusion, it’s probably easier than you think. 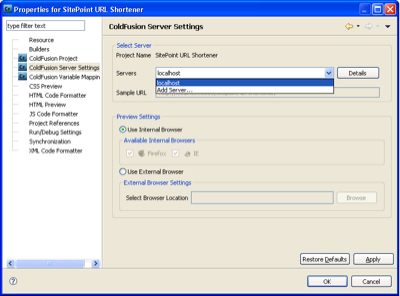 To demonstrate just how powerful and easy to use ColdFusion is, we’re going to build our own simple URL shortener from scratch. In this article, we’ll start out with a basic set of functions – creating shortened links, and expanding them. Don’t forget to try the quiz when you’ve finished reading! To follow along, you’ll need to download and install the ColdFusion 9 and ColdFusion Builder betas and install them on your development machine. ColdFusion 9 is also available for Linux, and it is possible (with some tweaking) to install ColdFusion Builder – see this tutorial at Compound Theory for details. You’ll also need to grab the code archive for this tutorial. This tutorial assumes that you have ColdFusion 9 beta running on localhost, on port 8500, using the stand-alone, built-in development server. If you’ve installed ColdFusion on a machine other than localhost, or are using IIS or Apache instead of the stand-alone development server, or are using a J2EE server configuration, you’re going to need to change the server paths mentioned in the code listings. We’re also going to assume that you have ColdFusion Builder installed on the same localhost machine. If you already have the Eclipse IDE on your machine (including Flash Builder or Flex Builder) and have installed ColdFusion Builder as a plugin, you’ll need to make sure you’re in the ColdFusion perspective: from the Window menu, select Open Perspective > Other > ColdFusion. Click on the Add Server icon – there’s a little yellow plus sign on it. Enter a name for the server – this is so it’s recognizable to you. I’ve entered localhost. Enter the port – the default for the built in development setup is port 8500. Browse for your Server Home. This is the directory where ColdFusion was installed – on Windows, it will probably be C:ColdFusion9; on the Mac, /Applications/ColdFusion 9. You might also need to browse for your Document Root. This is your web root – on a default Windows installation, it will probably be C:ColdFusion9wwwroot; on the Mac, it’s at /Applications/ColdFusion9/wwwroot. ColdFusion Builder will verify these details and connect to the server. If all went well, you should see the server in the Servers tab. You can start and stop the server and access its ColdFusion Administrator panel from this tab. ColdFusion Builder works with projects. We could create a new project now, and associate it with our development server, but to make things easier for you we’ve included all the code in a downloadable project which we’re now going to import. Download the sample zip file and extract the folder into your ColdFusion web root. Change the name of the folder to URLS now, if needed. 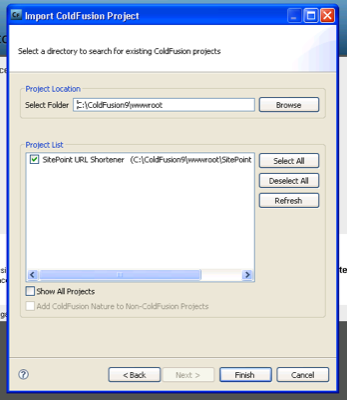 ColdFusion Builder will scan the folder and look for any project files, which will then be listed in the Project List below. Check the box next to our URLs project, and then click Finish. The project will now be listed in your Navigator panel. The last step is to associate the project with our server. Right click on the project name and select Properties. Select your local development server from the drop-down box of servers, and click OK.
Our URL shortener application will need a database. Apache Derby is an open source database with some fairly heavy-duty features, and it’s built right in to ColdFusion 8 and later. For our purposes, it’s perfect, because although Derby has no client and no user interface, setting up databases is very simple and there’s no need to install MSSQL, MySQL, or other database server. ColdFusion uses data source names to store database connections. Data source names are set up in the ColdFusion Administrator, which is the command central for your ColdFusion Server. To access the ColdFusion Administrator for your local development server, right-click on the server name in the Servers tab (remember, it’s down the bottom of the screen) and select Launch Admin Page. Once you’ve logged in, select Data Sources from the left hand menu. At the top of the screen there’s a form for creating a new data source. Enter “URLShortener” as the data source name, select Apache Derby Embedded from the driver dropdown and click Add. You’re nearly there! In the form that you are now shown, type “URLShortener” in the Database Folder (same as the data source name), and tick the Create Database checkbox. Hit Submit, and your Derby embedded database is created at the same time as your ColdFusion data source name. Are you still with me? Now that we have a development environment and a database, we’re ready to think about how we’ll develop our URL shortener. URL shortening applications are all over the Internet these days. URL shorteners aim to solve the problem encountered when trying to use long URLs in an instant message, a Twitter message, or any other form of communication with limited characters. The basic premise of a URL shortener is to give you a unique short URL to their site, which, when clicked will redirect the user to the longer URL. There are some fields in this database that are not strictly necessary for a simple URL shortener, but we’re going to use them in a follow-up article to this tutorial, so we might as well add them now. You can execute this code by clicking the Run icon in the toolbar – it’s a white arrow in a green circle. This will launch the script in your default browser. It is also possible to launch the browser inside of ColdFusion Builder by switching to a tab at the bottom of the editing window. There will be a tab for every browser that has been detected on your computer. While there’s nothing to specifically state that the operation was successful, it indicates that there were no errors, and shows the execution time and generated SQL code that was run, so we can safely assume that all is okay. Take a look inside the ColdFusion Builder project and you’ll see a couple of other .cfm files, and several .cfc files – one on the root directory, and one inside the /com subdirectory. Files ending in .cfm are regular ColdFusion template files. The .cfm extension tells the web server to pass them through the ColdFusion application server before serving them to the end user’s browser. A file with the .cfc extension is a ColdFusion component. This is ColdFusion’s equivalent to what is often called a class in other languages. The Application.cfc file in the root directory is a special kind of component which is run before each page request. It holds application-wide settings and has a set of special functions that are run when the application first fires up, before and after each request, when a user session is started or ended, and when an error occurs. As we will have multiple files in our URL Shortener application, and they are all going to need to use functions in content.cfc, we’re going to load that component into the application scope when the application starts. This means that on any page request, we’ll be able to reference any of the functions inside content.cfc by prefixing them with application.oContent. Enough housekeeping – let’s jump into some code. To allow our users to enter their URLs to shorten, we’ll need a form. Open up add.cfm in the ColdFusion Builder project root, and you’ll see a basic form. At the top of the form is some code that is run when a variable called form.action is defined. Essentially, a function from our content CFC is run inside a loop until the loop’s exit condition – the shortlink variable is not zero length – happens. We’ll examine what’s actually going on here in a moment. Skip down in the file and you’ll see a standard HTML template with a little bit of ColdFusion conditional display code – checking for a variable’s existence and if it is found, displaying it – and a HTML form to enter our URL to shorten. Fairly simple stuff. To generate our short URL, we’re going to create a function which returns a random string of a predefined length from a pool of acceptable characters. I’ve added 63 possible characters – uppercase characters A-Z, lowercase characters a-z, digits 0-9 and the dash character (-). A six-character string made up of these characters yields 636 possible combinations: that’s 62,523,502,209 URLs, which should be enough to keep us going for quite a while! This is the number of characters that will be generated for the shortcode. Should you wish to use more or fewer characters, you could simply pass a value for length into the function when it’s called. In this code snippet we’re also setting up a variable structure called local to store local variables. When we insert our link and short URL code into the database, we need to make sure that the short link value is unique in the database. To help with this, we made the shortlink column in the database unique, so if we attempted to insert a duplicate value, the database would throw an error. We're going to use this to our advantage. Next, inside an error-catching cftry block, we're going to attempt to insert the link and a short link code generated by our generateShortlink function. If the shortlink value is unique, the insert will be successful, and our insertContent function will return the new value to display to the end user. This loop will continue to run, generating new values and trying to insert them into the database, until it is successful and the value returned is not an empty string. The final piece of the puzzle is the code that actually accepts our shortened URL and redirects the end user to the real link. This code is inside index.cfm. First, we use the built-in cgi variable to read the contents of the current request's query string, and the Replace function to remove the question mark at the beginning of the query string. Because we're using the built-in development server, which is very basic, it's hard for us to generate cleaner short URLs - that is, URLs without a question mark in them. If you were building a URL shortening application that was going to be deployed on ColdFusion running on an Apache or IIS server, you would be able to remove the question mark from the equation. Finally, we take the link value returned from the database. If there's a valid URL there, we use a cflocation tag to redirect the user to this link. However, if nothing is returned - the value of link has zero length - then we're going to display an error message. This example is very simple and there are a lot of ways you could improve it, should you wish. As a starting point, there is no validation of the input variable - it would be nice if the URL add form displayed a message if the entered URL was not valid. I'm sure there's much more you could think of too! Stay tuned for a follow-up to this tutorial, where we'll expand on our URL shortener to include a rating widget. For now, try your skills at our ColdFusion quiz, proudly sponsored by Adobe, to check how much of this tutorial you've absorbed.